Steve and Rhiannon stopped by Borgida and Company, P.C. in Manchester this morning to make a donation to their 13th annual food drive benefitting the M.A.C.C. Community Food Pantry. After a few laps around the supermarket and some in-store, dry run construction, they ultimately erected a Christmas tree topped fireplace made entirely of cereal and pasta boxes–a truly festive donation! Justine attended the Glastonbury High School 2015 Career Fair on April 10th as a representative of the field of accounting and forensic accounting. The event was sponsored by the Glastonbury Chamber of Commerce and held at the high school. 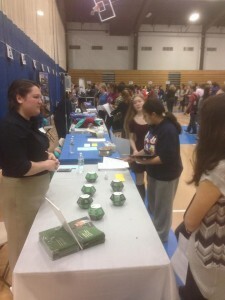 Students were able to visit the booths of careers they may have an interest in or questions about. Students brought many great questions about what it is like to be an accountant and how forensic accounting is different from traditional accounting. Steve and Justine volunteered as instructors for Junior Achievement at Assumption School of Manchester on March 25, 2015. Justine taught first and second grade students about communities, jobs, business, even taxes! Steve worked with seventh and eighth grade students focusing on jobs, goals, professionalism and branding. Steve spoke to the CT Association of Probate Clerks in Harwinton of Wednesday, March 25, 2015. He spoke to the group about finding fraud in typical probate documents and records, including accountings. Promoting an Ethical Culture at Georgia State University! Steve addressed an audience of administrators, coaches, professors, staff and more at Georgia State University on Monday, November 17, 2014 to deliver a keynote speech about Promoting an Ethical Culture. His presentation addressed the “Four E’s” of an ethical culture, ethics, environment, education and enforcement. Forensic Accounting Services, LLC is proud to be a sponsor of the first annual Believe 208 5K. On Sunday, September 28, 2014 Justine and her sister, Andrea, participated in the event. Check out our Facebook page for more pictures! The run was coordinated by Trish Buchanan and her two sons in honor of her late husband and their father, East Hartford Police Officer Paul Buchanan. Funds raised at the event will support Project BLUE 208 – Breaking the Silence of Law Enforcement Officers Underlying Traumatic Stress Through Education and Access to Support. The Connecticut Alliance to Benefit Law Enforcement (CABLE) is a non-profit that supports Project BLUE 208. Take a look at Steve’s latest article, posted on the Fraud Magazine website. In this article he addresses the constant changes in banking policies and procedures, mostly influenced by technology. Transitioning from paper to electronic records leaves the power in the hands of the bank. Be sure to familiarize yourself with the fine print for your personal and business bank accounts. Click the Fraud Magazine image to access a link to the article! Steve is frequently asked by clients, colleagues and others about the recent trends in employee theft and embezzlement; most often people want to know the cause. In light of these requests, Steve wrote an article on his opinion of the major causes of increased employee theft and embezzlement in society today based on his experience with fraud investigations. Check out the article by clicking on “The Dude” (left) to access a link to the article! Steve was given the opportunity to speak at the University of Bridgeport Waterbury Campus, where he addressed a class of future school administrators. The course is called Intermediate Administration and Supervision, commonly referred to as an “O92” course. On July 8, 2014 Steve presented “Financial Fraud: Increasing Your Awareness Could Keep You, Your School and Your Town Out of the Media.” The purpose of Steve’s presentation was to bring a greater financial awareness to educators before they become administrators to increase proactive measures within school districts. As of Monday, May 12th at the CTCPA Essential Event, Steve became the Chair of the CTCPA Education Trust Fund for the 2014 – 2015 year. On Friday, May 9th Steve spoke with Community College Scholarship recipients and guests at a luncheon hosted at the CTCPA in Rocky Hill. As the Chair Steve will work with a committee to raise and distribute scholarship funds to high school and college students within Connecticut. On April 24, 2014, Steve attended the annual Awards Banquet for the Department of Accounting at UConn. He presented Forensic Accounting Services’ annual forensic accounting scholarship to Annette Konopka (top photo). Annette is a junior accounting student who is active on campus and has a strong interest in the field of forensic accounting. Congratulations and best of luck, Annette! Steve, incoming Chair of the CTCPA Education Trust Fund, also presented the Junior Award on behalf of the CTCPA Education Trust Fund (bottom photo). This year’s recipient was Michael Atamanuk. Congratulations Michael! Steve and Justine participated as instructors for Junior Achievement at Assumption School of Manchester on March 19, 2014. Justine taught second grade and Steve taught seventh and eighth grade students. The program focuses on teaching life skills, decision making, budgeting, and career and educational choices. Forensic Accounting Services LLC sponsored a Greater Manchester Chamber of Commerce meet-and-greet holiday luncheon at the Chamber on December 5, 2013. The event was well attended by many Chamber members. Thank you to the Chamber staff for coordinating such a great event! Steve and Justine are seated with the Chamber of Commerce staff, Amy, April and Corinne. Heather and the CCSU Accounting Society participated in the annual CTCPA Children’s Book Drive in December 2013. Heather was the President of the CCSU Accounting Society at the time. She is shown with fellow Accounting Society members. Steve and Heather attended the 2013 Educational Trust Fund Dinner for the CTCPA on November 7, 2013. The Educational Trust Fund supports accounting programs in schools across the state as well as individual accounting students. Steve is a trustee of the fund, and presented awards to recipients. Heather attended as a representative of the Central Connecticut State University Accounting Society. For the third year in a row, Steve attended and spoke at the 24th Annual Association of Certified Fraud Examiners Global Fraud Conference. He traveled to Las Vegas, Nevada for 4 days to attend at the Aria Resort & Casino. This year his presentation addressed “How Theft Within Family Businesses Transcends.” The conference achieved a record number of attendees with approximately 2,600 fraud examiners present. Steve had the pleasure of speaking with both eye physicians and optometrist practice administrators at their annual conference on June 14, 2013. He focused on “Balancing Patient Care with Fiscal Care” for the doctors, particularly for those who own their own practices. The topic for the practice administrators was the revenue cycle and the many opportunities for fraud within medical practices. The conference took place at the Aquaturf in Plantsville, CT.
On June 7, 2013, Steve presented to an audience of a variety of law enforcement and private sector individuals at the “Spotlight on Fraud” annual conference for the International Association of Financial Crimes Investigators. Steve discussed conducting financial crime investigations from the private sector. The conference was held at Mohegan Sun casino in Montville, CT.
On April 17, 2013, Justine attended the annual Awards Banquet for the Department of Accounting at the University of Connecticut. She presented Steve’s annual forensic accounting scholarship to Emily Zielinski (right). Emily is currently a junior accounting student. She is interested in forensic accounting, and hopes to work for a federal agency someday after receiving a Masters’ degree in forensic accounting. Steve and Justine attended the 2012 Educational Trust Fund Dinner for the CTCPA. Steve is a trustee of the fund, and presented awards to recipients. Justine attended as a representative of the University of Saint Joseph. The Educational Trust Fund supports accounting programs in schools across the state as well as individual accounting students. On October 1, 2012, Steve attended and presented at the annual conference for the New England States Government Finance Officers’ Association. The conference was held in Hartford, CT. Steve’s presentation discussed the risks of theft in light of a suffering economy. From September 17 – 19, 2012, Steve attended the 3rd North America IDEA User Conference in Dallas, Texas. He conducted a training session on the data analysis software to attendees from across the country. Steve was interviewed on August 23, 2012 by Timothy Becker, a journalist for the Manchester Patch. In the interview, they discuss the basics of forensic accounting, as well as Steve’s professional achievements as an author, professor, and EMT. You can read the full article at: http://manchester.patch.com/articles/meet-stephen-pedneault-owner-of-forensic-accounting-services-llc#photo-11198526. Justine participated in Habitat for Humanity on South Marshall Street in Hartford, CT on Tuesday, August 6, 2012. Eleven members of the CTCPA New and Young Professionals group worked together to paint the entire interior of one of the 16 units under construction. The completion of this project will mark the 200th home built by the Hartford Chapter of Habitat for Humanity. Steve attended the 23rd Annual ACFE Conference from June 17-20, 2012. This year’s event took place in Orlando, FL at Gaylord Palms Resort. There was a record attendance of over 2,300 attendees! Steve was also a presenter at the conference. During his session he discussed the detection and resolution of a $1.8 embezzlement. This presentation marked Steve’s 200th speaking engagement to date. Steve funded his annual scholarship to an outstanding student with an interest in forensic accounting. Frank Fazzino, this year’s recipient, is a student at Portland High School & will be attending Bryant University in the fall to study accounting. Steve and Frank attended a banquet at the Aqua Turf on June 5, 2012. Steve presented two conference sessions on April 20, 2012 to members of the International Association of Orthopaedic Executives – Indianapolis. The conference was held at the popular Conrad, a luxurious hotel and conference center located downtown (pictured). The sessions were focused on preventing and detecting employee theft and embezzlement in an orthopedic practice setting. Justine attended the annual Awards Banquet for the Department of Accounting at the University of Connecticut on April 18, 2012. She presented two scholarships, provided by Steve, to Rob McNaboe (left) and Richard Bosco (right). Steve and Justine participated as instructors in two Junior Achievement Days in March 2012. The first was in an eighth grade classroom at Assumption School of Manchester. Later in March, they volunteered in the first-ever Junior Achievement Day at Bennet Academy of Manchester. The program focuses on teaching life skills, decision making, budgeting, and career and educational choices. The Connecticut Business and Industry Association (CBIA) is the broadest-based business membership organization in the state, as well as the largest. CBIA’s membership includes businesses of all types and sizes throughout the state. CBIA is the leading voice of business and industry at the State Capitol and before state administrative agencies. CBIA produces a Business Minute every weekday, sharing information that is relevant to businesses across the state. The Business Minutes cover a variety of business issues. See below to hear more from Stephen regarding forensic accounting.